Discover Japan's Inland Sea on two wheels along the quiet roads of Awaji and Shikoku Islands with rewarding views of impressive mountain peaks and equally beautiful seascapes. Explore some of Japan's most beautiful gardens, see its most impressive castle and delve into the history of Hiroshima. This exciting journey begins in the old Imperial capital of Kyoto. Regarded by many as the country's finest city, Kyoto has been at the heart of Japanese culture and influence for over 1,000 years. One of the only major cities to survive the extensive bombing of WWII, Kyoto can boast more than 2000 temples and shrines, many set in manicured landscaped gardens, making this captivating city the cradle of all things uniquely Japanese. After checking in to our hotel, which will be our base for the next two nights, we will enjoy an included dinner with the rest of the group and our Tour Leader at an izakaya - a casual Japanese tapas-style place for drinking and eating. Kyoto is home to an impressive 17 UNESCO World Heritage sites including 13 temples, three Shinto shrines and a 17th century castle. After breakfast we pick up our simple city bikes for the day and commence an exploration of the city on two wheels. We plan to cycle to Arashiyama district on the western outskirts to see its famed bamboo grove, the Oi River and Tenryuji temple. Later we visit Ryoanji temple and its famous rock garden, and the golden pavilion of Kinkakuji temple before returning to our hotel. We forward our main luggage to our hotel in Takamatsu in advance of tomorrow's ride on Awaji Island. You will need an overnight bag for the night on Awaji Island that will be transported while you ride. 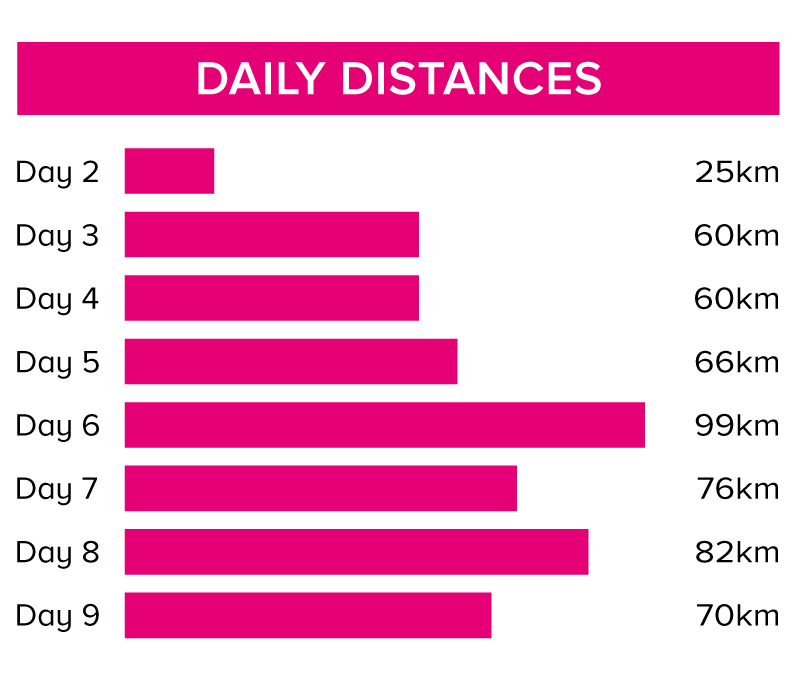 Our total cycling distance today is approximately 25 kilometres, mostly on the flat. This morning we leave Kyoto by local train on a 1 hour journey followed by a short ferry ride to reach the island of Awaji. Upon arrival, we pick up our bikes and begin our cycle journey in earnest. Our main bags go into the support truck that will accompany us on our rides to Hiroshima, and has space for two clients. According to Japanese folklore, Awaji is the birthplace of Japan and there are many locations that are related to the legends of how the nation was born. It has also long been known for its high quality produce and used to supply the imperial court with livestock, seafood and vegetables. Nowadays the famous Kobe and Matsuzaka beef is reared here. Most visitors zip across the island on their journey between Honshu and Shikoku, but we spend the day exploring the countryside and learning about life on the island. Our total cycling distance today is approximately 60 kilometres (total accumulated ascent 300 metres). After breakfast we cycle to the nearby port of Minami Awaji to board a boat to view the famous whirlpools of Naruto. These cannot be guaranteed as they depend on the tidal flows, but when they occur they are a very impressive sight. Afterwards, we bid farewell to Awaji Island as we transfer by local bus to the island of Shikoku, meeting our bikes again in Naruto where we will start riding to make the journey to Takamatsu. On the outskirts of town we will stop to visit Ritsurin Koen - considered one of the best landscaped gardens in Japan, set in front of the wooded Mount Shiun. Our accommodation for tonight is in the port city of Takamatsu , the principal city of Shikoku. Our total cycling distance today is approximately 60 kilometres (total accumulated ascent 540 metres). Referred to as the Aegean of the East by 19th century explorers, Japan's Inland Sea is the huge protected body of water lying between the main islands of Honshu, Shikoku and Kyushu. Surrounded by important cities and used as a major trading route, the Inland Sea has often played an important part in the history of Japan. We start our coastal cycle ride in Takamatsu but quickly leave the city behind as we ride on less developed roads with great seascape vistas. Aside from a decent climb 10 kilometres in, the day is spent on small rolling hills and a couple minor climbs in the final 20 kilometres. Finally we reach our destination in the coastal town of Kanonji. Our total cycling distance today is approximately 66 kilometres (total accumulated ascent 350 metres). 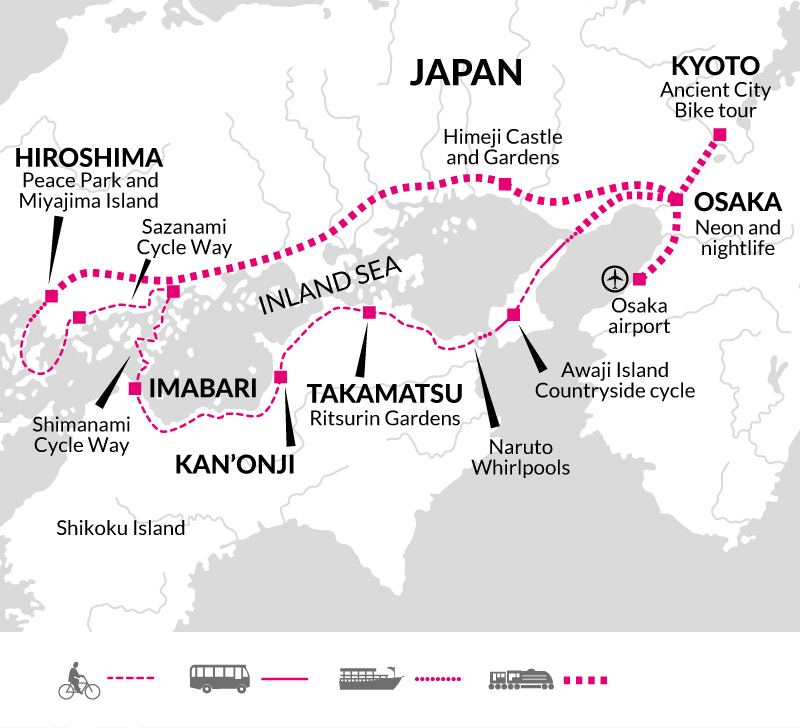 We start our longest cycle ride of the trip early today as we make our way to Imabari. Shikoku was considered remote and isolated for centuries, synonymous with natural beauty and the pursuit of spiritual perfection and accessible only by boat. Modern day pilgrims are drawn to the 88 Sacred Temples of Shikoku. The island was connected to the rest of Japan by impressive bridge systems in the past 30 years but it is still relatively unvisited by foreign tourists. We encounter a number of ports and fishing towns on our route but the scenery is varied as around half of today's ride is spent inland. Although we summit a 160 metre hill today, the gradient is gentle. Finally we reach the modern port town of Imabari where we spend the night. Our total cycling distance today is approximately 99 kilometres (total accumulated ascent 420 metres). Today we leave the island of Shikoku behind and traverse the Inland Sea on a beautifully scenic ride across a series of bridges that leap-frog six islands back to the mainland of Honsu. Constructed in 1999, the Shimanami Kaido means 'island, wave and sea route' and is the most famous cycle ride in Japan. There are some steep ascents to reach the soaring bridges that give majestic views of the many small islands and high quality roads throughout make for a smooth and enjoyable ride. The cycle path is generally adjacent to the highway on the bridge sections then once on the islands it deviates from the highway but shares the road with local traffic. Our final destination is our hotel in the town of Onomichi. Our total cycling distance today is approximately 76 kilometres (total accumulated ascent 420 metres). Today's cycle route is not as well-known as the Shimanami Kaido but it has all the appeal and is not nearly as popular. Starting out from Onomichi, the seaside route we take, known as the Sazanami Kaido, is a cycle way on Japan's mainland and closer to the many islands dotting the inland sea. Our cycle ride today finally reaches the ship building port city of Kure where we spend the night. Our total cycling distance today is approximately 82 kilometres (total accumulated ascent 240 metres). On our final day of cycling, we explore three very quiet islands in Hiroshima bay, again little visited by foreign tourists. The lack of traffic makes for a great last ride. We cycle firstly from Kure, across Kurahashi, Nomi and finally to the tip of Eta Island where we bid farewell to our bikes and continue on to central Hiroshima by way of a short ferry ride. Our total cycling distance today is approximately 70 kilometres (total accumulated ascent 320 metres). Today we have a thought-provoking visit to Hiroshima Peace Park and later to the island of Miyajima by public transport. The target of the first atomic bomb to be used in wartime, Hiroshima was completely destroyed on 6th August 1945. Since then it has literally risen from the ashes, and is now a thriving, friendly city. In the Peace Memorial Park, the well-presented museum sits on the hypocentre of the 1945 A-bomb. Whilst serving as poignant reminders of the nuclear holocaust, their over-whelming message is of hope that such horrors will never reoccur. Later today we take a public ferry to Miyajima - a holy island known for its ancient temples and forests that offers a nice contrast to the city. We forward our main luggage to our hotel in Osaka in advance of tomorrow's train ride. We leave Hiroshima by train this morning on our journey to Osaka. After around one hour we leave the train at Himeji to visit Japan's most impressive feudal castle - a UNESCO World Heritage site. We will also visit the beautiful Japanese garden here in Himeji. We continue on to Osaka by train (1 hr) for a final afternoon of sightseeing and a great celebratory evening meal in Japan's second largest city to mark the end of our journey. The tour ends this morning after breakfast in Osaka. General: Pack essentially for hot or mild weather depending on the time of the year. Please note that each accommodation provides yukatas (pyjamas), soap, shampoo, conditioner, towels, tooth brushes, and often disposable razors as well. If you are not bringing cycle shoes then try to bring stiff-soled shoes as these are better for cycling - transmitting your energy into the pedals more efficiently. This becomes more relevant and recommended the more demanding the grade and distances to cover. We recommend you bring a daypack (big enough to carry what you need for a few days) and one main piece of luggage (total allowance: 44lb/20kg) which will be transported between hotels while you cycle. We will forward the main pieces of luggage on day 3 to the hotel in Takamatsu, and you will see it again on day 4 when we arrive at the hotel. Again we will forward the main luggage on day 10 to the hotel in Osaka, and you will see it again on day 11 when we arrive at the hotel. On all Explore cycle holidays we strongly recommend you bring along and wear your cycle helmet. It is a legal requirement in Japan to wear a helmet that meets current safety criteria. In case of an accident resulting in personal injury, certain insurance policies are invalidated in cases where a helmet was not being worn. Cycle glasses to protect against dust, pollen and the sun, padded cycle gloves and a water bottle or water delivery system (e.g. camelback or platypus) are also useful. You may choose to bring your own gel seat cover for added comfort. If a handle bar bag or pannier is not provided (check bike details) then you may like to bring a small rucksack to wear while cycling. There is no vehicle support on day 2 so you would need to cycle with your rucksack or put your bag in the small basket on the front of the bikes. Other items to consider bringing are a sunhat and sun cream, torch, earplugs and insect repellent. Please carry some or all of your cycling equipment e.g. helmet as part of your hand luggage. Standard - Our mid-range accommodation offers a good level of service. The accommodation we use on this tour doesn't have bars, gardens or swimming pools. Generally rooms will be comfortable with en-suite facilities. Japan: Visas are not required by UK, Australian, New Zealand, US and Canadian citizens. Other nationalities should consult their local embassy or consular office. You should confirm all visa related questions with the relevant Embassy prior to departure. On this tour we cycle approximately 540 km over eight days (an average of 67 km per day). We travel mainly on quiet country roads and along some cycle paths (15%). We will encounter more traffic in the urban areas. The terrain is generally undulating. A support vehicle (with room for two passengers) accompanies the rides throughout the tour and carries the luggage, except for the city bike tour in Kyoto. We have graded the route as moderate to challenging. 16 gear Orbea Avan, Cinelli Experience 105/11S road bike with flat handle bars or similar. Simple local bike in Kyoto. Your included bike is a 16 gear Orbea Avan, Cinelli Experience 105/11S road bike fitted with flat handle bars or equivalent and will be the correct frame size for your height. If you prefer an 8 gear Orbea hybrid bike please request at time of booking. A water bottle holder is included as well as the facility to fit your own pedals or saddle if you wish to bring them. A support vehicle (with room for two passengers) carries our luggage and accompanies the rides throughout the tour except on day 2. We provide spare parts and take care of the day to day maintenance. A simple local style bike is provided in Kyoto. All you need to bring is your own helmet.